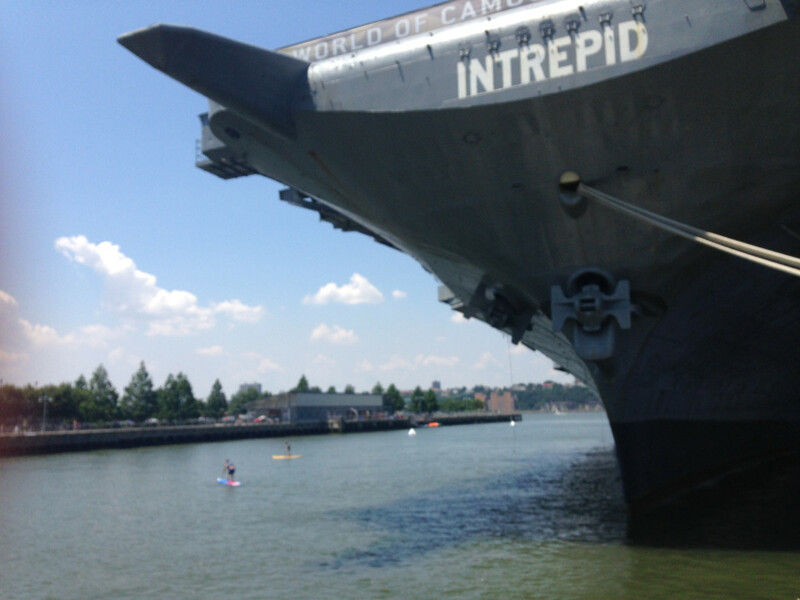 Stand up paddling around The Intrepid feels… small. The giant ship-turned-museum casts a shadow on the Hudson, making me feel diminutive as I move around it, trying to stay to the edge of the shadow. Looking in to the Hudson feels murky and I’m praying my balance stays with me. When I signed up for the Advanced Beginner lesson, they asked if I could swim. My answer? “Yes, but hopefully not in this.” A triathlon I did some years back had a Hudson River swim; while wetsuits weren't mandatory, they were highly recommended, largely to keep the general yuckiness factor to a minimum. Thankfully, my swimming skills were not put to the test as I navigated around. It was a smooth day on the river, and there were almost no waves, just hints of ripples. In the city, owning your own stand-up paddle-board is a rarity: in addition to needing space to store it (considering the cost of even having enough space to store yourself and your clothes) there’s also a need for a vehicle to transport it and most Manhattanites eschew cars. Luckily, there are plenty of companies that rent out paddle-boards—though not right in downtown—and some in downtown that offer lessons and guided tours. Want to do a double duty workout? SUP Yoga is available now as well. Tours can run from an hour to a few hours depending on what you’re looking for. If instruction isn't your thing but you only want to get out for an hour, take off from the Pier and paddle around the Hudson on their shortest tour. Looking for adventure? Go farther down and explore some of their eat-and-SUP options or even go to the Statue of Liberty (a five hour trip). Prices range from $40 to $125 depending on the tour but compared to everything else in Manhattan, it’s pretty reasonable. There are Twilight Instructional Classes and Twilight Tours as well and they’re fantastic for enjoying the city as it comes to life and lights up at night. It’s a great way to relax at the end of the day. You can always see the city during your paddling trip and I can almost guarantee that you’ll forget the stresses that typically go with it. The classes are fun and the instructors are ultra-helpful and friendly. If you’re a total newb to SUP-ing, the Fun SUP class is a casual affair that’s more play than school (for those who preferred recess to gym class). If you’re hoping to really get faster and stronger, consider SUP Basics 1 or 2 and for a really funky workout, SUP Yoga is a blast. Located at Pier 84 at West 44th St and the Hudson, the Manhattan Kayak Company offers reasonably priced tours and lessons throughout the week during the summer. Classes range from beginner to relatively advanced and while they don’t simply rent out the paddle-boards, their tours are fun enough to make up for the lack of independence.